Join this budget group safari in Maasai Mara National Reserve, Kenya, one of the best game safari spots in the world. Explore the amazing and diverse African wildlife, including The Big Five, cheetahs, jackals, hyenas, and numerous bird species. Catch the phenomenal wildebeest migration, which is an annual spectacular event that can only be seen in Maasai Mara. Book your seat for an unforgettable experience. Lenchada Tourist Camp is a budget safari camp just outside the gates of the Masai Mara Game Reserve, regarded as one of the wildlife jewels in Kenya. Lenchada Tourist Camp offers accommodation in semi-luxury tents, all ensuite with hot and cold water, toilet, changing rooms, and lockers for valuables. The tent front canvas wall can be opened completely to allow an open view. The camp is built with all the comfort of a home, including solar-heated showers, bed with pillows, sheets, blankets, and mosquito nets. Additionally, as a backup, a standby generator that supplies lights and refrigeration for the dining area, allows phones and digital cameras to be recharged. The camp is surrounded by a natural environment, waking up to bird twittering and roaring of lions. The friendly receptionists are available and can deal with any of your inquiries and questions on various tour activities in Masai Mara. 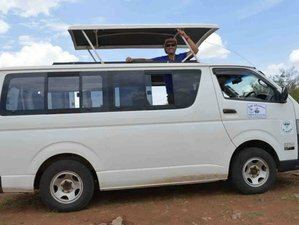 At 8:00 a.m., you will be picked up from your Nairobi hotel and commence the drive to Masai Mara, via the Great Rift Valley view point, where you will have a breathtaking view of the Rift Valley floor. Picnic lunch will take place on the way. In the afternoon, after you check in, you will depart for a game viewing drive in the Masai Mara Reserve. You will return back to the camp for a sumptuous buffet dinner ending with resting time at Lenchada Tourist Camp. You will spend the full day exploring Masai Mara, in search of The Big Five. You will have picnic lunch in the reserve as you scale the Mara beauty situated on the banks of the Mara River. In the evening, you can optionally visit the local Masai village for a cultural tour where you can learn about the Masai community and interact with the local people. A balloon safari at a discounted 380 USD per person can be organized in the early morning, and then proceed with the normal program. Overnight stay will be at Lenchada Tourist Camp. You will enjoy the last early morning game drive in Masai Mara Reserve, followed by breakfast. Thereafter, you will commence the drive back to Nairobi. You will arrive around 4:00 p.m. and will be dropped off at your Nairobi hotel. This marks the end of the tour. Kenya is a country full of surprises and many are amazed to know that besides safaris and wildlife, the country also has some of the best beaches in East Africa. The beauty of this land is that it is easy to enjoy a safari and a beach holiday, besides the assortment of activities and sights it has to offer. Kenya’s coastline boasts brilliant blue water, lined with protective coral reefs, creating ideal conditions for swimming, snorkeling, sailing, and water sports. The palm-lined beaches are the ideal relaxing environment for the end of your safari holiday. The Masai Mara Reserve is the most popular touristic destination in Kenya, located in the Great Rift Valley, in primarily open grassland. Wildlife is most concentrated in the reserve’s western escarpment. The reserve is regarded as the jewel of Kenya’s wildlife viewing areas. Maasai Mara is an area of preserved savannah wilderness in southwestern Kenya, along the Tanzanian border. The landscape has grassy plains and rolling hills and is crossed by the Mara and Talek rivers. The area nearby is dotted with villages (enkangs) of Maasai people. It is in the Mara that perhaps the most spectacular event of the natural world takes place, the great migration. This is the annual migration of millions of wildebeest and zebra from Serengeti in Tanzania in search of water and pasture. Following on their heels are the predators of the savannah, lions, cheetahs, jackals, hyenas, and vultures. During this safari, you will be served daily breakfast, lunch, and dinner, along with bottled water. If you have special dietary requirements, it is a good idea to communicate it to the organizer when making a reservation. Lenchada Tourist Camp is passionate about cooking and found its inspiration in the French, English, Italian, and Danish cuisines. Food is cosmopolitan and modern, with clear notes from the far east, India, and Africa’s traditional cooking. the camp also offers a comprehensive selection of Africa's finest wines. Breakfast, lunch, and dinners are served in the restaurant or in the bush garden with incredible views of the Mara River and the wild animals coming to drink. If one wishes to venture a little further, one can also enjoy a romantic bush dinner set beneath the starlit African night. During free time, you can touch the skies with a hot air balloon safari. You can also visit the Masai Mara village and experience how the locals live in the middle of the bushes, with zebras grazing and lions roaring just outside their homes, and get to know their culture and customs. A walking safari is another amazing experience. It gives you an intense feeling of the greatness and the astonishing Masai Mara ecosystem. Walk almost quietly through the diverse arrays of grass and enjoy the fresh smell of the plains and the heat of the sun. Please book your flight to arrive at Jomo Kenyatta International Airport (NBO). Perfect Wilderness Tours and Safaris can pick you up at an extra cost of 20 USD. Pick up from your hotel in Nairobi is included in the price. Airport: Jomo Kenyatta International Airport Airport transfer available: Jomo Kenyatta International Airport (US$20 per person) Additional charges may apply. You can request this in the next step. Perfect Wilderness Tours and Safaris is a travel organizer led by a team of dedicated organizers and guides who provide tours and safaris across East Africa.